Hey everyone. I have a fun and sparkly review for you today! 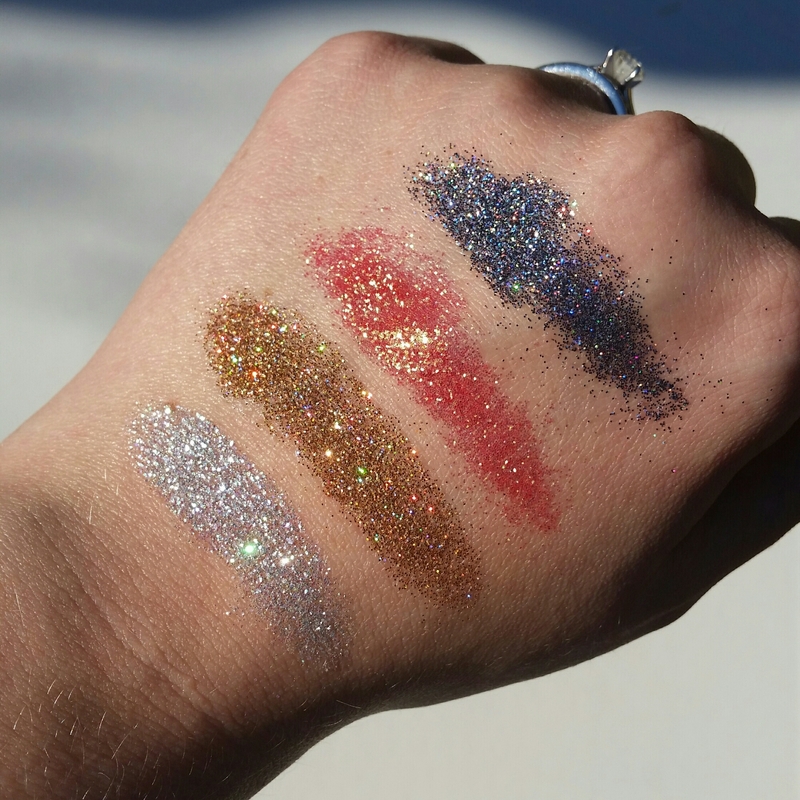 There’s no better way to add some glitz and glam to your makeup look than glitter, and the glitters in today’s review come from a company I love-LIT Cosmetics. 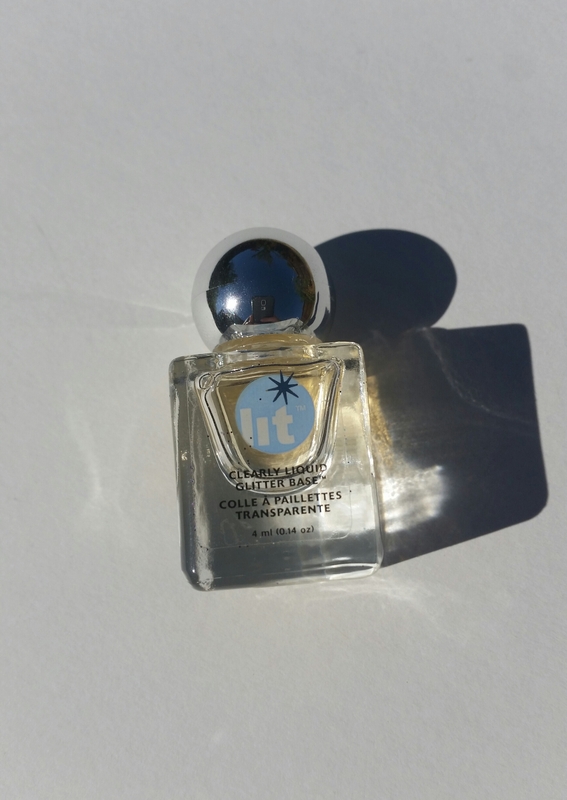 LIT’s glitters are cosmetic grade, formulated without parabens, sulfates, and phthalates, and are vegan and cruelty free. There are endless colors and sizes to choose from with size 1 being the smallest and size 4 being the largest. 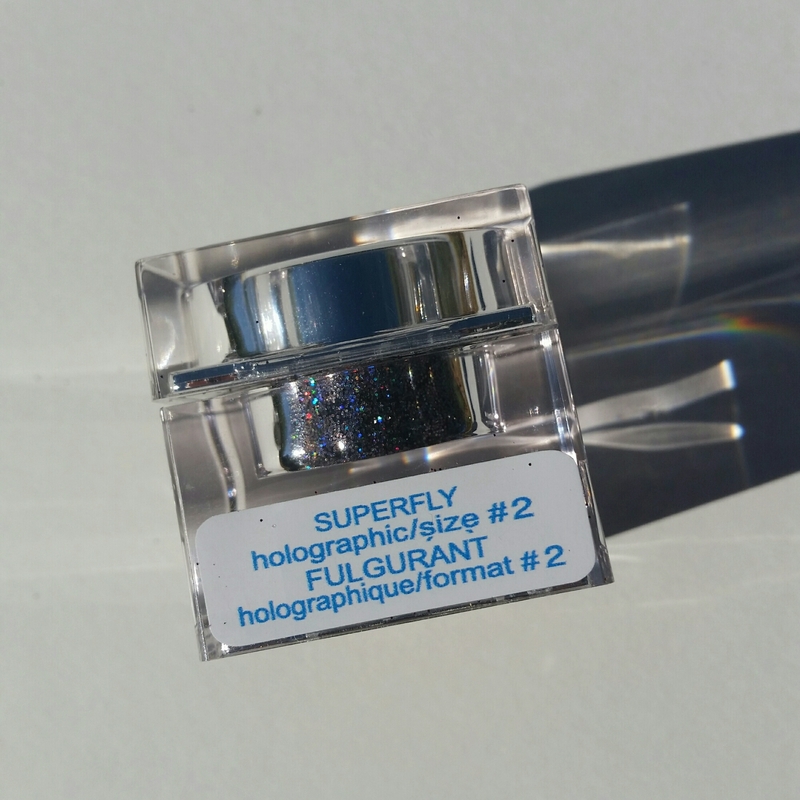 There are 3 finishes to choose from including holographic, shimmer, and solid. 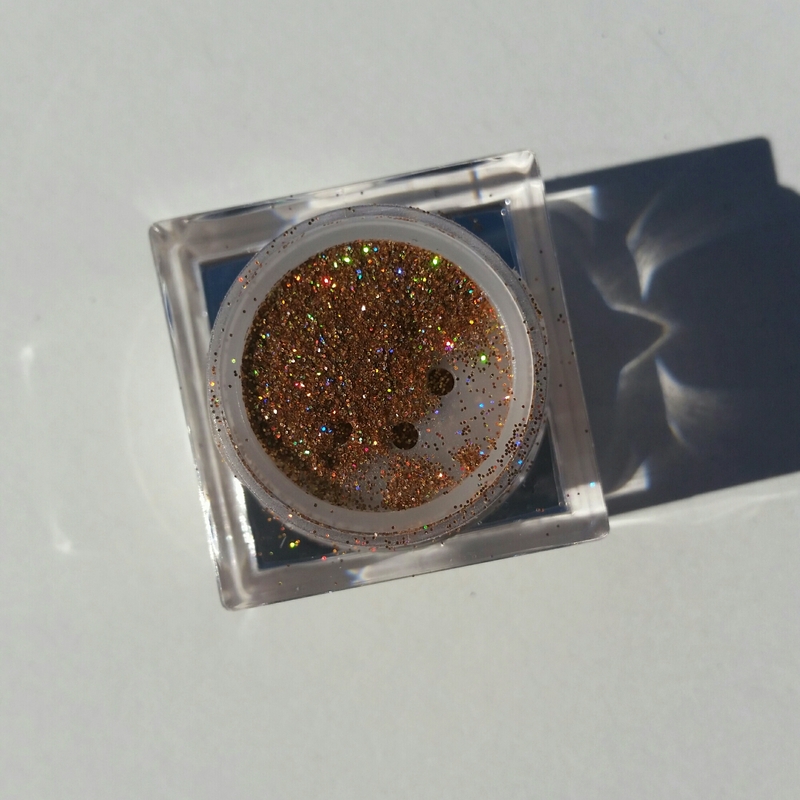 I have four glitters to share with you as well as my thoughts on the Clearly Liquid Glitter Base. 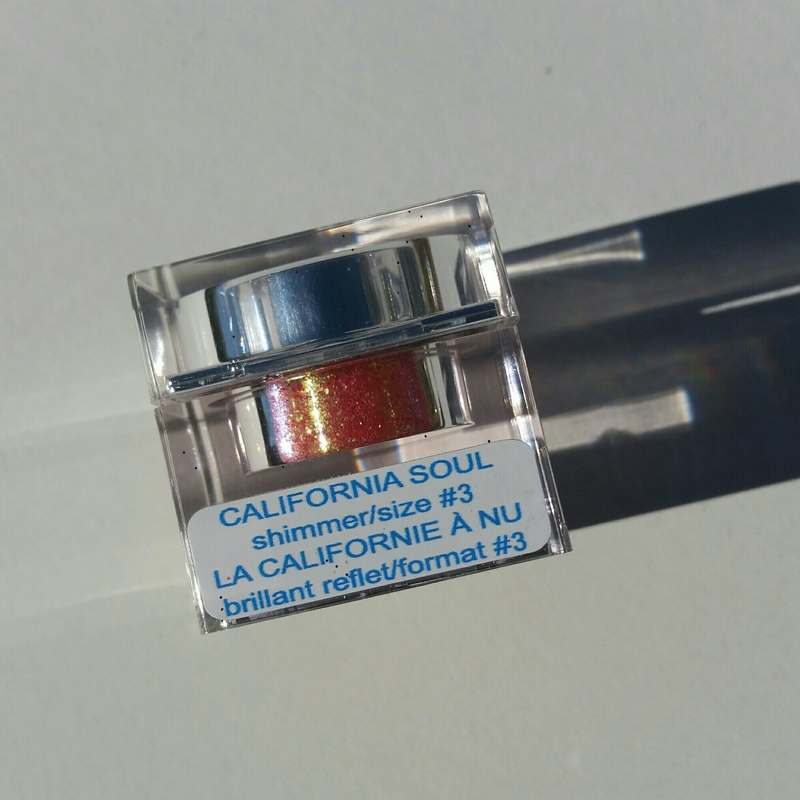 I purchased two LIT Kits (Tinsel Town and Rich and Famous), and my other two glitters (Superfly and California Soul) I got for free when LIT was doing an amazing promotion on their Instagram page where you got two free glitters if you bought one LIT Kit! 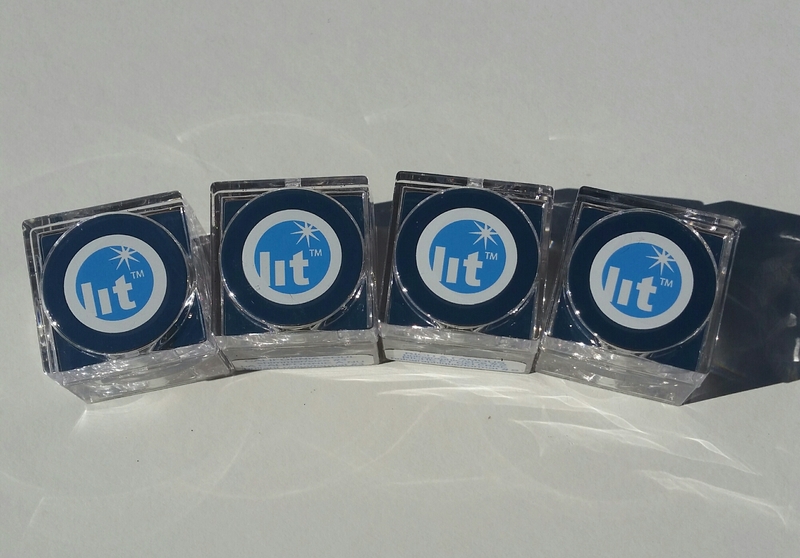 The LIT Kits are a great deal and perfect introduction to LIT’s products. 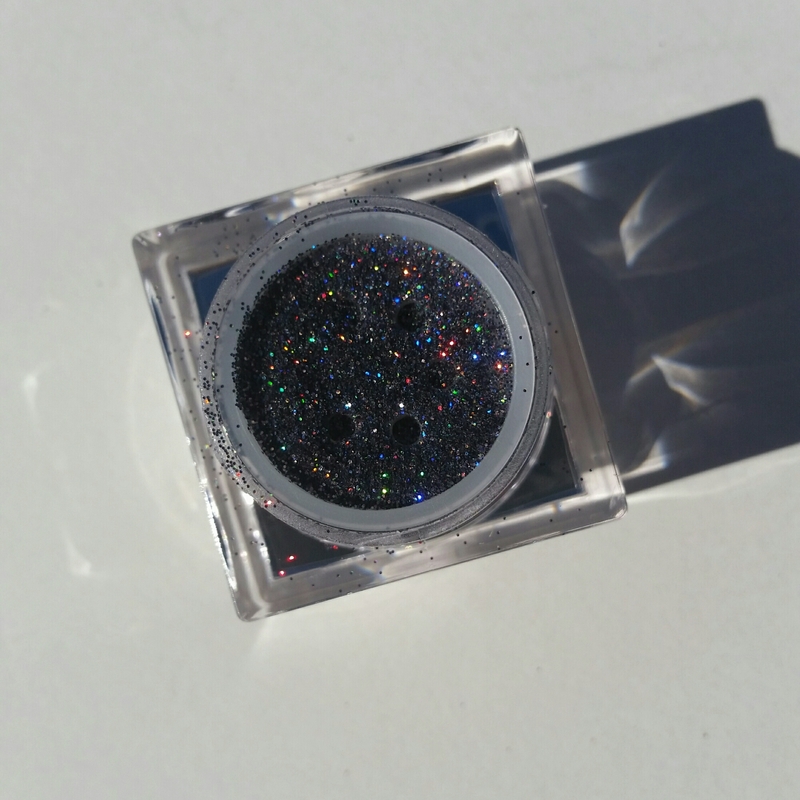 You get a full size glitter along with 4ml of the Clearly Liquid Glitter Base for less than the combined individual prices of both. 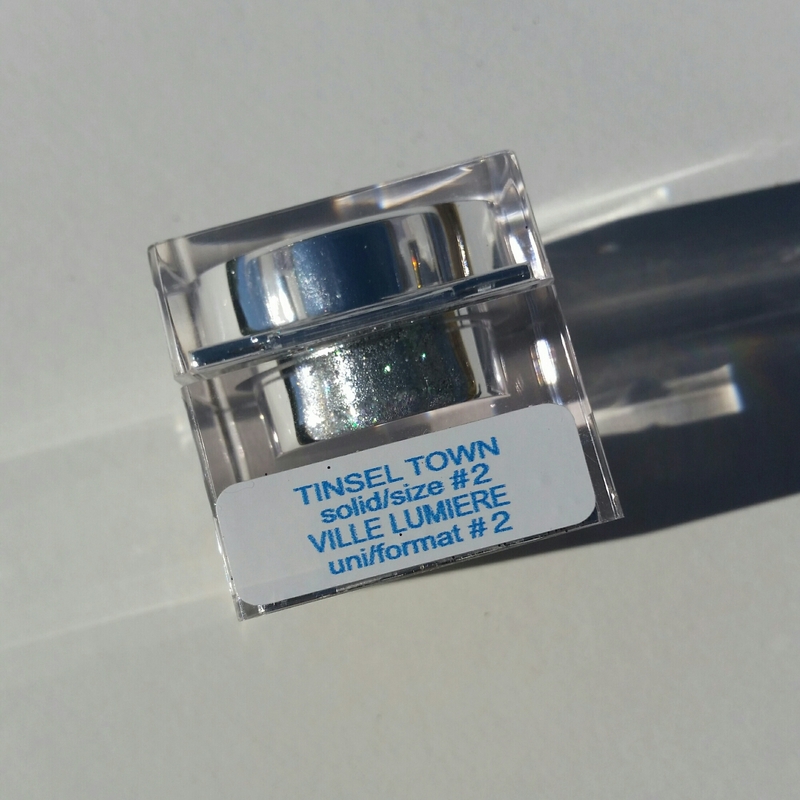 And while the 4ml size glitter base looks small, it should last you a long time. I’ve had mine for ages and still have a ton of product left. You can order LIT products online from their website. Lets start with the Clearly Liquid Glitter Base. It’s a clear liquid (obviously) that serves as an adhesive for your glitters. It’s packaged in a glass bottle with a screw top lid. It’s a little thicker than water but isn’t as thick or sticky as a glitter glue. 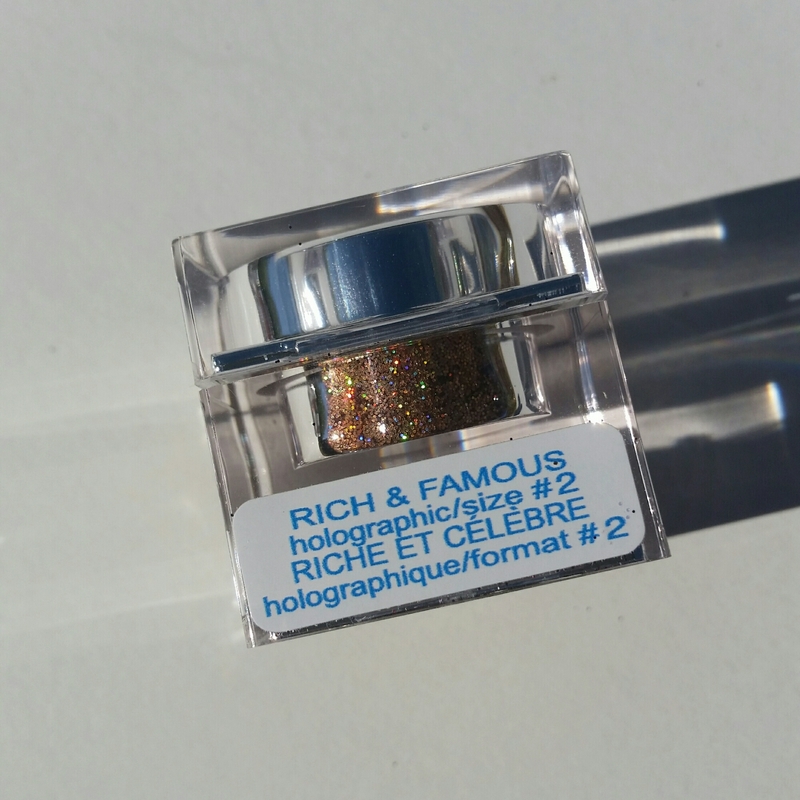 I’ve used this many times with great results – my glitter application lasts all day. You can apply it with your finger or a brush and then pat the glitter on top, or you can mix the liquid with the glitter and then apply the mixture with a brush. The latter a great way to make your own glitter eyeliner. Everything washes off easily with my normal cleanser. I would definitely recommend this product, and it is my favorite way to apply glitter! On to the glitter. To get straight to the point, I love these glitters! There are so many colors, finishes, and sizes to pick from, and all of the glitters I have are gorgeous and perform well. 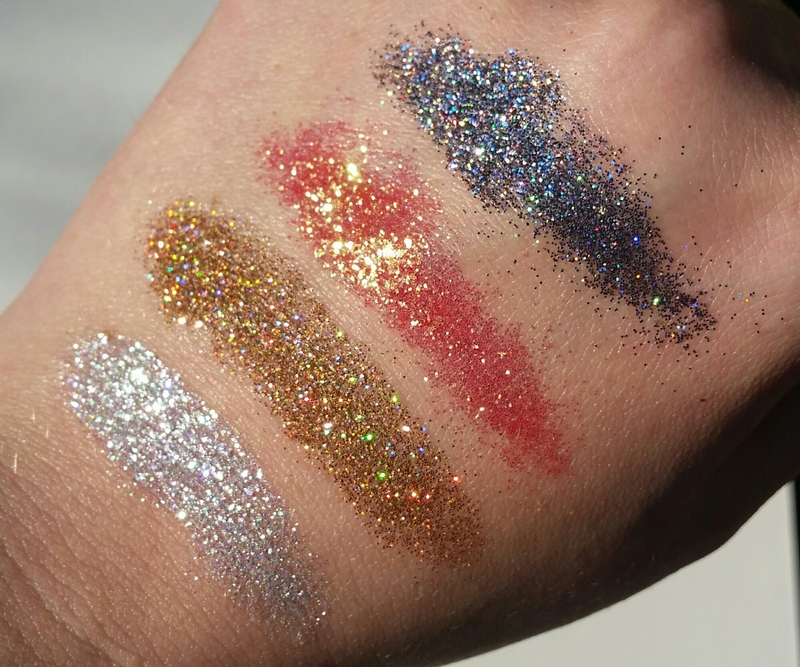 I love that glitter is such a versatile product and can be used on the eyes, lips, nails, brows, etc. 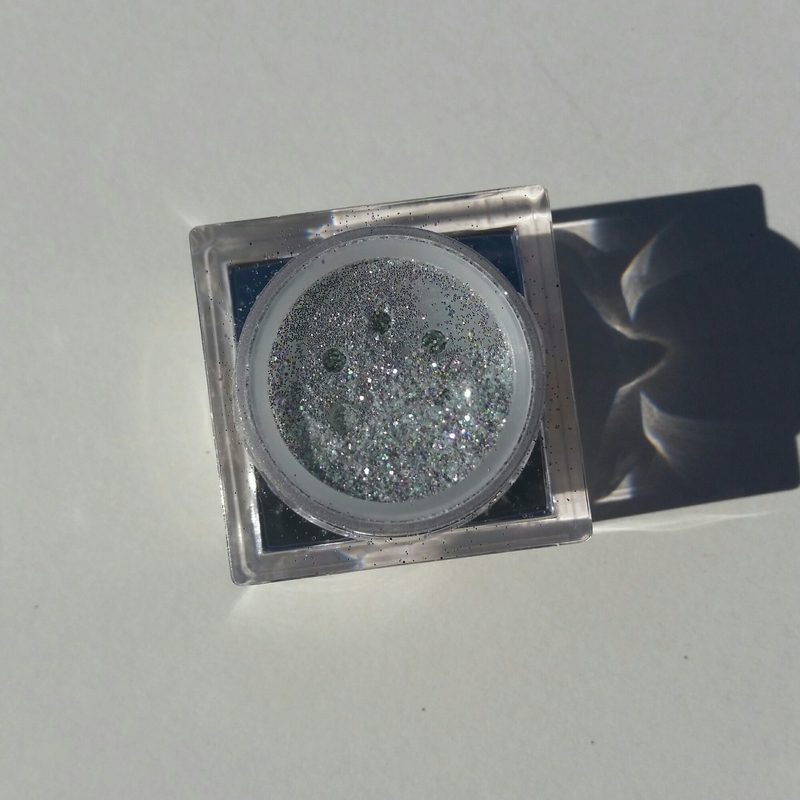 LIT glitters are a rounded shape (instead of a diamond or square) for comfort and smooth application. 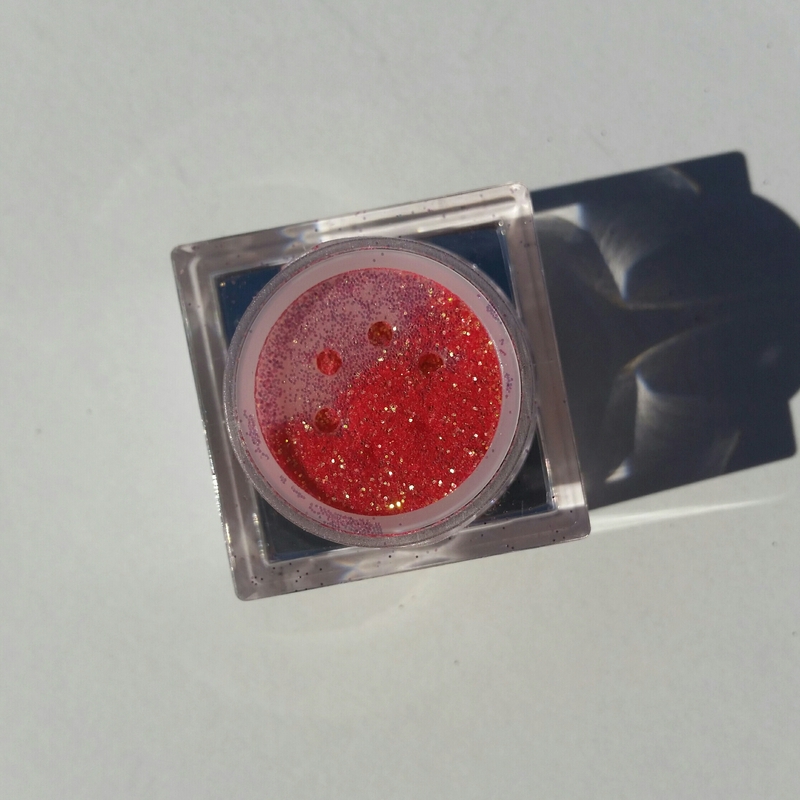 As I mentioned above, they are also cosmetic grade glitters which is very important for the safety of your eyes since cosmetic grade glitters are made with the proper materials, dyes, and shapes that are safe to be worn. I also love the packaging. They come in a very sturdy square plastic container, and the lid clicks into place when fully closed. If you take of the lid, you can twist one pot into the bottom of another pot to stack them. There is also a sifter on top when you open the product to help keep glitter from going everywhere. There’s really nothing negative I have to say about these glitters! One last reason why I love LIT’s products is their company philosophy and personality. 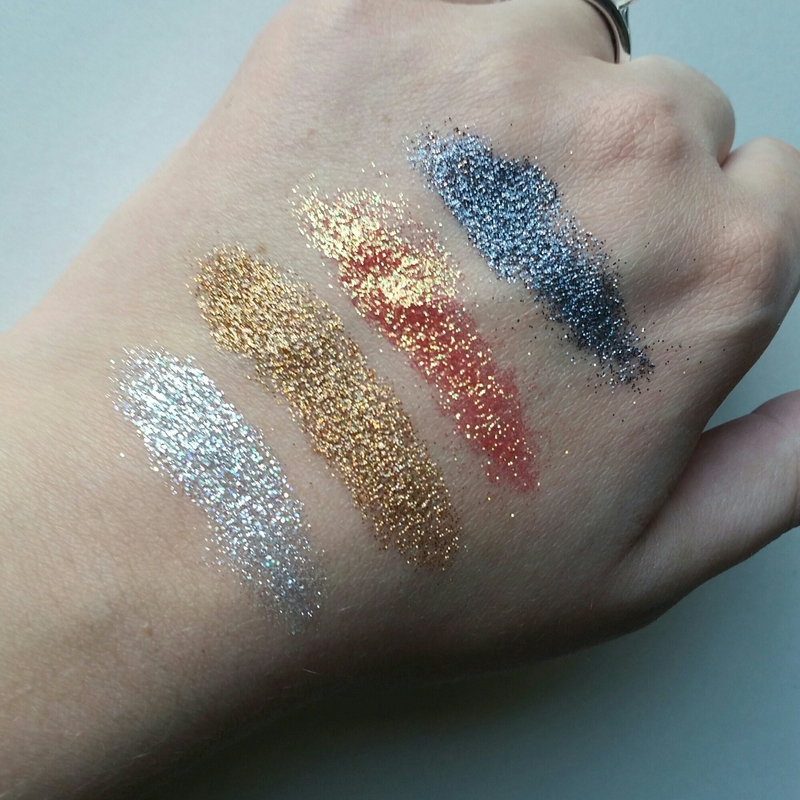 When I sent in my email to get my two free glitters during their Instagram promotion, Jodie (LIT’s founder) sent me a cheery email thanking me for my support. LIT Cosmetics has liked and commented on my Instagram photos (which always feels super flattering!) 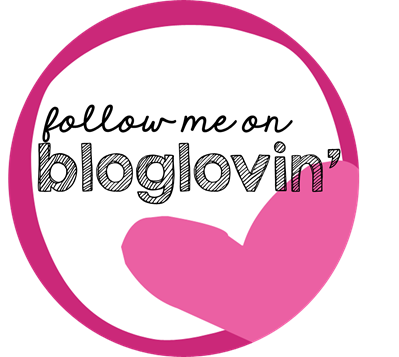 They emanate an incredibly fun and positive attitude on their website and through their social media accounts. They share the lovely work of many makeup artists and makeup lovers on their social media accounts and have also been vocal about keeping the beauty community a positive place. I personally love to support this kind of positive company, and really appreciate their personal and kind interactions with their supporters and customers. Please enjoy the photos below, and I hope this post was helpful! Aren’t they amazing?! And there are so many colors. Plenty of neutrals too 😉 If you can find the little kits in Sephora it’s a good deal! Oh really? Maybe they will have some at Christmas time. Oh wait, Christmas time seems to be now! They seem to be hit and miss in store for some reason! But actually you can get the kits on LITs website too! Duh! Those glitters are stunning!! I’ve seen so many good reviews on this “glitter glue”. I feel like I may have to try these out some day!! They really are! Yes I’ve had great luck with it 🙂 thank you for reading!